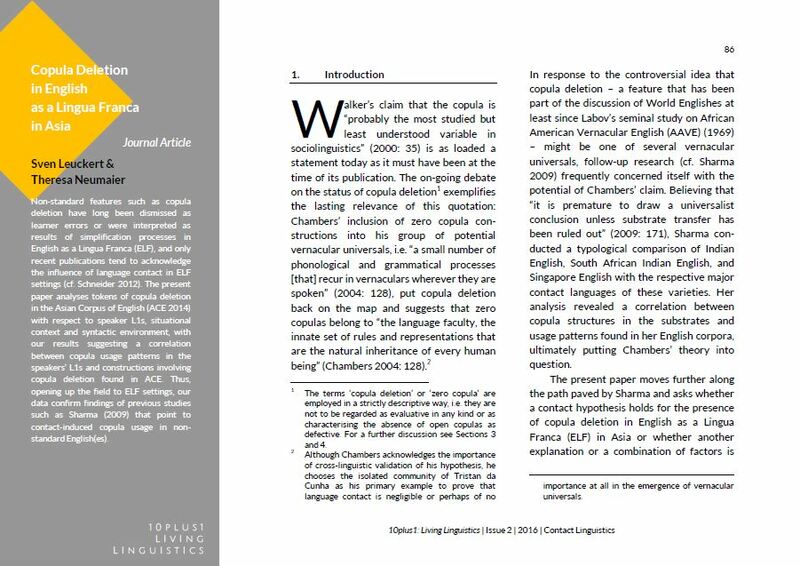 Non-standard features such as copula deletion have long been dismissed as learner errors or were interpreted as results of simplification processes in English as a Lingua Franca (ELF), and only recent publications tend to acknowledge the influence of language contact in ELF settings (cf. Schneider 2012). The present paper analyses tokens of copula deletion in the Asian Corpus of English (ACE 2014) with respect to speaker L1s, situational context and syntactic environment, with our results suggesting a correlation between copula usage patterns in the speakers’ L1s and constructions involving copula deletion found in ACE. Thus, opening up the field to ELF settings, our data confirm findings of previous studies such as Sharma (2009) that point to contact-induced copula usage in non-standard English(es). Sven Leuckert obtained an M.A. in European Linguistics from the University of Technology in Dresden. He is currently employed as a research assistant to Edgar Schneider at the University of Regensburg and finishing his PhD project on topicalization in Asian Englishes in Dresden. His research interests include, but are not limited to, Asian varieties of English, language typology, English as a Lingua Franca, and (syntactic) language change. Theresa Neumaier received her M.A. in English Linguistics from Ludwig-Maximilians-Universität München and is now working as a research assistant to Edgar W. Schneider at the University of Regensburg. In her PhD project she is investigating patterns of conversational interaction in varieties of English. Her research interests include varieties of English, Conversation Analysis, Discourse Analysis, and language contact.